Knowledge, strength, courage for your children. How is Krav Maga good for your child? Every parent wants to know that their children can handle what life throws at them, especially when they are by themselves outside the home, at school or out with friends. Krav Maga self defense will give your child the knowledge to avoid and de-escalate potentially risky situations, the strength to walk away from trouble, and the courage to stand up for themselves when they need to. Good kids often don’t know how to handle these types of situations. It is critically important that every young person knows how to prevent being bullied or attacked by other children or even abducted by an adult. Finally if the situation requires it, they need to know how to physically defend themselves. Krav Maga San Francisco offers a 2 hour anti-bullying seminar for $39. Keep an eye on this page and our calendar for scheduled seminars. We also offer 2 regular weekly classes for young people on Tuesday and Thursdays at 4:30 pm. After the seminars, students can also join us for a 1 week membership to reinforce what they learned, plus a 10% discounted membership if they decide to continue their training after that. If you’d like to inquire about self defense seminars for young people, give us a call at 415-921-0612 or send us a note in the contact form here. We look forward to hearing from you! Krav Maga Instructor David Ruiz teaches our Thursday afternoon classes for young people ages 8 to 12. David has been with KMSF since 2012 and is a Green Belt level instructor. He also teaches adult Level 1 and 2 classes. He lives in San Francisco with his wife and has 2 sons in middle school. 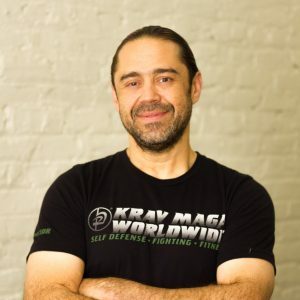 David feels that Krav Maga is the ideal self defense system for young people because we go one step beyond what is taught in school and teach kids what to do when avoidance and de-escalation don’t work. We teach them how to react to a physical altercation or threat when there is nowhere to run and no one to help. Krav Maga Instructor Sasha Khylbova teaches our Tuesday afternoon classes for young people ages 10 to 14. Sasha has been with KMSF since 2016 and is a Blue Belt level instructor. She also teaches adult Level 2/3 and KO Bag classes. She lives on a farmhouse in Sonoma County and is the mother of two boys who both have Krav Maga training. Sasha loves teaching kids and is a former elementary school art director. The biggest strength she sees in her students is confidence, both internal and with their bodily coordination. She is also impressed with Krav Maga’s flexible and pragmatic nature, and finds that translates well into kids and teens being able to engage with it.